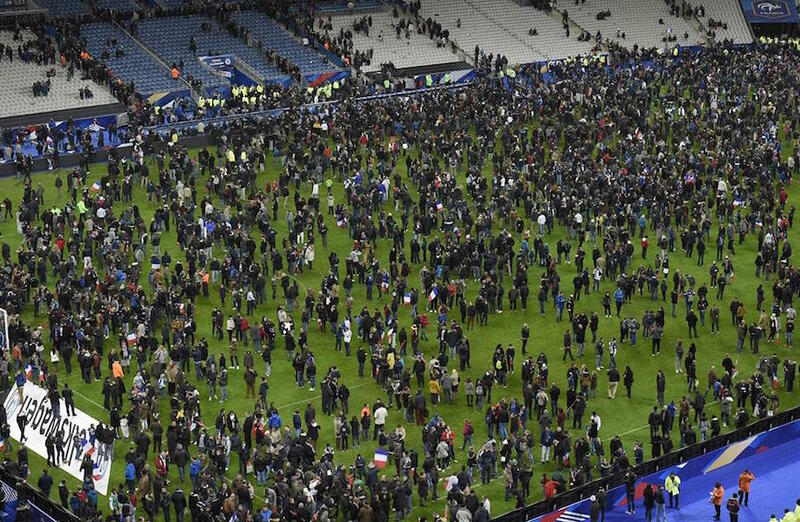 It’s not surprising that the crazed “Soldiers of the Caliphate” terrorists selected the France-Germany soccer match at the Stade de France as the central target in their assault on Paris. For starters, the match was a high-profile attraction bringing together 80,000 fans, including French President François Hollande, in a tight space. And, as American moviegoers across generations can tell you (see Black Sunday from 1977 or The Sum of All Fears from 2002), televised sports events present highly dramatic, desirable targets for terrorists. Indeed, the Stade de France was the one target in Paris last Friday night where the terrorists must have known they’d encounter a level of security they might not (and ultimately did not, thankfully) overcome. But still they deemed it a worthwhile attempt. At least one, and possibly up to three, suicide bombers sought to enter the stadium. As it happened, the first bomber detonated his vest upon being stopped at a security perimeter (the boom was heard during the game’s telecast, and was confused within the stadium for firecrackers). Two other suicide bombers blew themselves up outside the stadium; between them, the thwarted bombers only took the life of one victim. The gruesome plan probably entailed sequencing the explosions inside the stadium in such a way that would have killed (before the eyes of the head of state and a global TV audience) not only scores of people seated near the bombers, but also possibly hundreds or thousands more in an ensuing panicked stampede. There is another more substantive reason why Islamist fanatics intent on a war between civilizations would target a major soccer match: the sport’s singular role in bridging Western culture and Muslim youth. If you are a crazed “Soldier of the Caliphate,” soccer ranks up there with Hollywood movies and American pop music among the most potent threats in your deluded campaign to win over hearts and minds around the world. Soccer is one form of global pop culture not driven by the United States, but it’s still a potent Western influence. If terrorists in the Middle East spend any time fantasizing about attacking an NFL or NBA game, it’d only be because they know Americans care about those games; they themselves, and the public in their home countries, certainly don’t. But soccer—the global sport centered around Europe’s major leagues but drawing in players, fans, and business interests from most of the planet—is an obsession throughout the Muslim world. The game also offers the most prominent example of successful cross-cultural assimilation within Europe. Targeting a match between the French and German national squads may have been a way to strike at two “infidel” nations at once. But, as analysts were quick to point out after the attacks, some of the most prominent French and German stars in recent years—Germany’s Mesut Özil and Sami Khedira, France’s Karim Benzema and Bacary Sagna, among many others—are Muslim celebrities of immigrant backgrounds. The impressive diversity of Europe’s major soccer leagues, and of their national teams, has long been a potent force for disarming xenophobic anti-immigrant sentiment, and outright racism, across Europe. North African immigrants have never felt more welcome in France than when the entire nation rallied around Zinedine Zidane, the captain of the 1998 World Cup-winning French squad. And it is no small cultural milestone for Turkish immigrants in Germany to have millions of German fans these days wearing a jersey bearing the name of midfield artist Özil. But the converse often gets overlooked: the impact of immigrant players on the mindsets of soccer fans across the Middle East and North Africa, and the crazed terrorists who thrive on the narrative that there is no compatibility between degenerate infidel societies and righteous Muslims. The sport is a seductress of Muslim youth, as it is of all youth around the world, much to the chagrin of those eager to fend off Western influences. Across the Middle East, soccer has been a galvanizing force in the debates over whether girls should be allowed to play sports. And just look at any photos of large crowds milling about anywhere in the region—whether at a Syrian refugee camp in Jordan or an upscale mall in Dubai or Saudi Arabia—and you will invariably see some people sporting Real Madrid, Barcelona, Bayern Munich, or Manchester United jerseys. European games are avidly watched across the region, courtesy of Qatari-owned beIN Sports, the same TV network broadcasting Spanish and French games to U.S. audiences. The success of so many Muslim and immigrant players in the English, Spanish, French, and German leagues provides a constant counter-narrative to tales of immutable estrangement and alienation between West and East. And it isn’t just about players—business interests from Muslim countries (most prominently the airlines from the Gulf states) brand themselves through the sport, to a point where people in the Middle East (and as far away as Malaysia, in the case of some teams) proudly feel that certain fabled European clubs belong to them. In some cases, they literally do. Paris’ own iconic team, Paris Saint-Germain F.C., is now owned by Qataris. The targeting of soccer by jihadists fighting modernity should only intensify as the game’s influence continues to expand in the Muslim world. And when you look at the calendar of upcoming major tournaments—with the next two World Cups slated for Russia and Qatar, and next summer’s Euro Championship hosted by France, kicking off in the targeted Stade de France—security forces everywhere, not to mention lovers of the game, should consider last Friday night a declaration of war by the terrorists against the world’s most beloved sport. Andrés Martinez writes the Trade Winds column for Zócalo Public Square, where he is editorial director. He is also professor at the Walter Cronkite School of Journalism at Arizona State University.